Our upstairs solarium is gradually filling up with more and more plants. In the foreground of this picture you can see some citrus trees, tomatoes, herbs, and in the background peppers, onions and another sea of tomato plants. A picture of a 6.5 week old tomato plant. The variety is debarao tall vine tomato. In 6.5 weeks they have grown to ~2 feet tall and have started flowering. 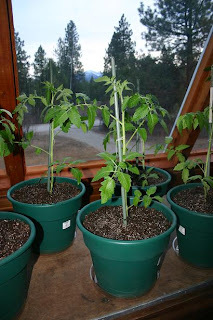 It looks like we will be keeping some tomato plants in the solarium and transplanting some to the greenhouse, even if the minimum temperatures out there aren't quite ideal. We never expected the tomatoes to grow this quickly. I guess they just love the solarium. At the current rate, maybe just another couple weeks until we can harvest some tomatoes? At this latitude and in an unheated solarium, we feel like we're navigating uncharted territories by using our solarium as a space to grow foods. Its certainly not easy to find charts and timetables that apply to our specific growing needs. We started the arugula and lettuce above at the same time as the tomatoes. It's hard to believe actually, but they spent the same amount of time under grow lights. 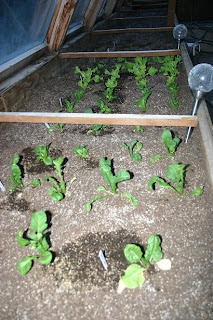 The lettuces and arugula were transplanted into the greenhouse ~ 2 weeks ago. Currently, the minimum temperatures in the greenhouse are between 33 and 38 degrees each night. Outside, the temperature regularly drops into the teens at night. Our maximum temperatures in the greenhouse range from 80-101 while outside the temps have maxed out at ~60. 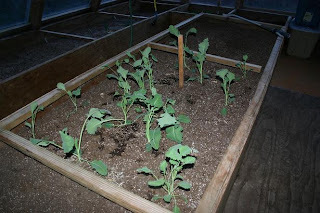 These kohlrabi survived a Montana winter and continue to grow, albeit quite slowly. We don't have the heart to pull these plants out quite yet, even though we'll be planting tomatoes in this bed shortly. Last weekend we direct sowed some different types of lettuce into beds in the greenhouse. Our savory has been blooming in the solarium for a couple weeks now and looks so pretty. We are finally starting to harvest some of the herbs that I started from seed this winter. All of our herbs have been growing in the upstairs solarium on a railing. 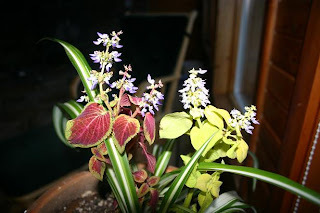 I moved this coleus around several times this past summer and it eventually ended up with a spider plant in our unheated solarium. It has literally been blooming since the summer and has done well in the temperatures in our solarium. This summer I think that I will be growing a lot more coleus. 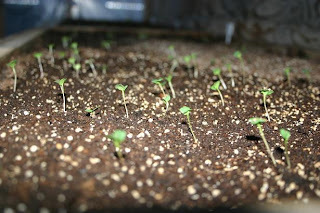 Our little itty bitty coleus seedlings just germinated a week ago. 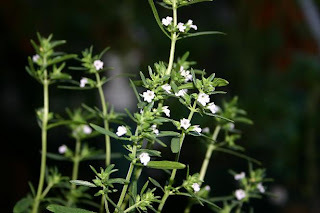 I hope to let ours flower this year so I can save a few seeds. I still can't believe you have citrus trees, I hope they continue to do well for you. Currants grow great in this area have you given them any thought? Well, I think I may have a bit more gardening knowledge than your grandma, but maybe not that much more. Right now there are ~24 tomato plants in the solarium and ~36 pepper plants! I may have seriously over estimated not only our needs, but our space for growing at this time of the year. Ah well, seeds are fairly cheap and the pots can all get re-used next year. I think we probably will try some currents out. We're setting aside some space in our garden for berries and are thinking of doing a 20x20 berry cage at some point. My husband makes wine and is much more likely to eat berries than a lot of the veggies I'll be growing. Nice variety of plants! Our tomatoes are doing especially well this year - not sure why.